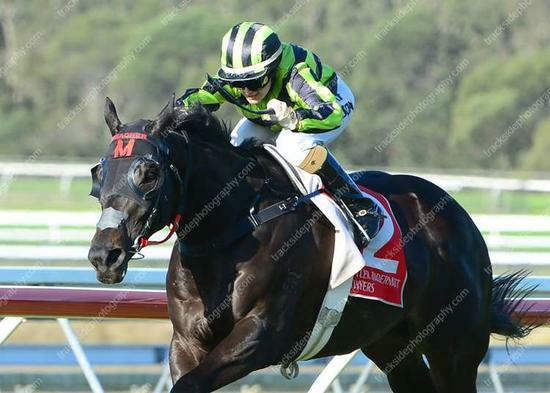 Divine Dice broke his city class maiden status with a courageous win in the 1200m Yaroomba Beach C&G No Metro Wins Handicap at the Sunshine Coast. Drawing the outside barrier, jockey Tegan Harrison was able to use the geldings gate speed to come across the field and lead after 200m or so. From there it was a matter of patience before kicking clear turning for home and holding on for the win. "This guy is as tough as nails, as he had to do it at both ends today, after drawing the car park, so in the end it was a very good effort. We were confident he would run well, with the only question mark being the barrier, but thankfully Tegan was able to get across to the rail to lead and rate him perfectly once there. He ran well for us down in Melbourne, winning and being placed, but he has obviously enjoyed coming back home to Brisbane. Basically we will just keep ticking him over for now and look for races that he can progress through, he might even get a bit further than the 1200m he has been running over, but we will see about that later on this prep. There are a whole bunch of owners in him, so congratulations to all of them and I am sure they will celebrate this win to the fullest. Also a heap of praise must go to, to Andy (Kermond), our stable forman and all the Brisbane staff, for the great job they are doing with the horses we have here." Commented trainer Chris Meagher.